Due to the birth of my first grandchild I have not shown for a couple of months but what an amazing day we had today. I took a burmilla kitten and a blue self kitten to the Three Counties cat show. The blue self Karsama Bluevelvet had a red card day and was Best of Breed and Karesama Silver Seavelvet my burmilla girl spolit her red card day by having a third place in one class but bless her she beat off stiff competion to be first and Best of Breed. 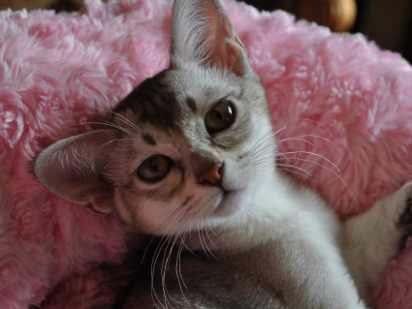 Oh…and our lovely red burmese Kupro Red Fariequeen won her first CC at the tender age of 9 months. My thanks to Joyce and well done Ruby!